It was a rainy day to start with and we were a bit worried that nobody would turn up. We were wrong, we had lots of people dropping off items at the skips. The collection teams did a great job going to the addresses of the people who'd booked collections of large items - the council machine made short work of chewing up sofas. Things were a little quieter in St Thomas's Hall where the smaller items that had been dropped off were displayed for people to take away. 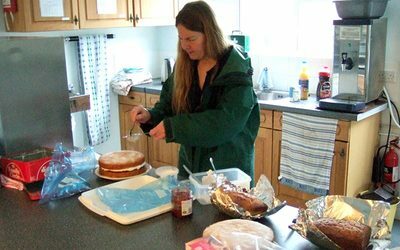 The home made cakes and coffees went down well, especially the victoria sponge that had been made by Committee Secretary. The raffle was drawn and the money raised from that and donations, a total of £46.70, will go to Romsey Mill. Lots of bikes were handed over and they will go to Camtrust, where they will be spruced up and sold. The furniture that wasn't taken way by residents was given to Emmaus and the rest of the items donated to charity. 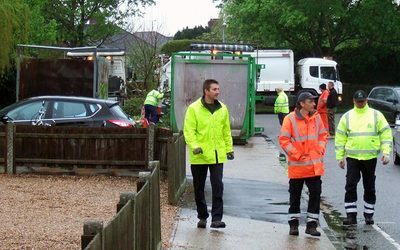 Many thanks to our volunteers, local resident Tim Morley and the members of the C3 Community Church and the Council workers, who all worked really hard and got rather cold and muddy. It was a very successful day and we couldn't have done it without you. 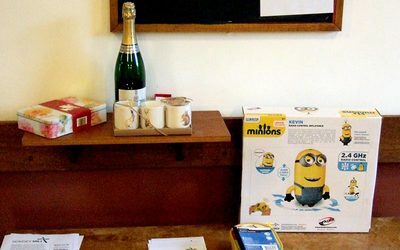 Images above: raffle prizes; Council workers getting ready; assembling the cakes in the kitchen. If you have any images to add please contact us.